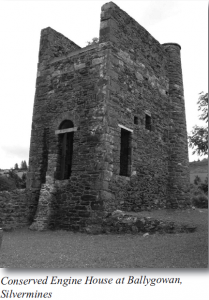 The heritage and history of the Silvermines area is unique in terms of mining and for centuries now, mining has been carried out at various stages and with varying degrees of intensity. The earliest mention of mining in this area dates to 1289 when Italian miners from Genoa and Florence in Northern Italy came to Silvermines in search of silver. In a most comprehensive article written by Waterford historian Des Cowman, and published in the 1989 edition of the Tipperary Journal, the author traces in some detail the sporadic mining of the 19th century. It is a valuable and comprehensive insight into the workings and conditions of mining of that period. This article will deal principally with mining of the 20th century. In 1874 mining ceased at Silvermines due to a fall in prices and competition from other overseas markets. In 1917, influenced no doubt by war-time emergency, the British Government Department dealing with natural resources, drilled at Ballygowan, behind the village of Silvermines. In 1929-30 Non Ferrous Metal Corporation reopened the drainage tunnel, sampled old workings and drilled six boreholes exploring the calamine zone again at Ballygowan. It took until 1948 to break the silence of 20th century mining production when the Silvermines Lead and Zinc Company was formed. The company was incorporated on 30 August 1948 as a Private Limited Company under the name of the Irish Exploration Co. Ltd., with an authorised capital of £500, to acquire lead, zinc, copper, silver and baryte bearing properties and mining leases in the County of Tipperary. The Company adopted the name of Silvermines Lead and Zinc Co. Ltd., and became a Public Company on the 30 April 1949, when the capital of the Company was increased to £350,000. Among the subscribers to the new Company was George Edward (Ted) Russell, a Limerick business man who was to become the most important figure in Silvermines Mining for the next four decades. It was intended that developments would take place at two locations, both previously mined down through the centuries, one at Ballygowan, Silvermines, and one at Shallee three 3 km west of the village. The first stage was the development of a ‘pilot’ Waelz Rotating Kiln to treat 40 tons per day of the calamine (zinc bearing) ore to produce zinc oxide. This German designed plant was built on site by local labour. It was the first time that electricity would be used in mining at Silvermines. The plant operated for 22 months from October 1950 to July 1952. It cost £25,000 to erect. The Waelz Kiln technology process is a rotary kiln which is typically up to 180 ft in length and up to 12 ft in internal diameter. Kiln feed consists of blended metal-bearing sludge and oxide dusts mixed with an appropriate amount of a suitable reducing agent (coal, petroleum coke or metallurgical coke fines). From the start, the plant at Silvermines proved problematic and never reached the potential envisaged by the developers. Although preparations were made for obtaining calamine ore for the Waelz Plant by open-cast mining, it was also envisaged that underground mining would be necessary to feed the new plant. It was for this reason that the sinking of a vertical shaft, known as the Russell shaft, was embarked upon. Naming a shaft after the chairman or some prominent member of the mining operations was in keeping with tradition and we also find the King shaft and the Barry shaft at Shallee from the 19th century, together with the Knight shaft at Garryard from the 1960s at the Mogul operation. The sinking of the Russell shaft commenced in August 1951 and after sinking through surface alluvium and into the limestone to a depth of 38 ft., the mat was poured and the shaft concreted to surface. Sinking then recommenced and made good progress until the beginning of November, when at a depth of 107 ft a large fissure making some 1,000 gallons per minute was struck in the limestone on the south side of the excavation, which flooded the shaft and drowned the pump. Despite the installation of larger pumps which reduced the inflow of water, after some days of pumping, a decision was made to resort to ‘cementation’ to seal the water. The shaft was plugged with a 12 ft. plug of concrete. Mining Engineer, S.V. Griffith, concluded in his article regarding the Waelz Plant that: 1. The plant was a pilot plant with no precedent in Ireland. 2. The manufacturers, unfortunately, did not consider it necessary to so design the pilot plant that all unnecessary labour would be eliminated, the outcome was excessive manual handling in all departments of the process, resulting also in high costs. The lack of trained personnel to operate the plant led to many expensive mistakes in the early days and added still further to the general cost. To obtain raw labour from the surrounding farms and outlying villages and to train them as shift bosses, burner men, and plant operators, and to instil into their minds the need for careful temperature control, the accurate sampling of calamine feed, zinc oxide, and slag, and many duties connected with the efficient running of a plant, as well as teaching them the reasons for the various operations, was heartbreaking during the first months of kiln operation. The total tonnage treated was 7,081, yielding 790 tons of oxide. Running parallel with the Waelz Plant in Silvermines, the development of a lead mine at Shallee was more prolonged and more intensive. It was also more traditional in operation and featured underground and open-cast mining, use of a ball mill for crushing, railway for conveying the ore and it also revisited the workings of seventy years earlier. Development work was done on an incentive bonus system, by means of which the miner was paid a standard weekly wage plus a bonus on the footage advanced, provided this reached the target figure set for the particular heading, explosives having being supplied free by the company. The drill crew was expected to obtain a target figure of 20 ft. per week of six shifts for which they would have received a bonus of four shillings and sixpence per foot for all footage obtained, while the helper was paid three shillings and sixpence per foot on the footage advanced. The Shallee operation closed in 1953 due principally to the fall in metal prices after the end of the Korean War. Towards the end of the following year, after a recovery in metal prices, the Company obtained fresh funds through the issue of £100,000, coupled with a trade loan by the Minister for Industry and Commerce, of £120,000 repayable within a period of five years. This new capital was to be used to refurbish the lead ore treatment plant and to carry out an extensive prospecting and diamond drilling programme to secure a regular supply of higher grade ore for the plant. The Shallee mine reopened in 1955, but in 1957 the Company was forced to increase the Trade Loan by a further £60,000, of which £36,000 had been drawn down when the Directors decided, due to the continuing low grade of ore and a sudden down-turn in lead prices, to close down all mining operations as from January 1958. And so ended the loss-making phase of mining processing in Silvermines. By this stage the Company owed the bank £156,000. During the mining operations the Company built four houses in the village of Silvermines for its staff. The General Manager, Gerald Moorehead lived at Silvermines Cottage, which was on lease from Lord Dunalley. He was appointed to the Board in 1953. He retired in 1959 to take up an appointment overseas. He was succeeded by W.K. 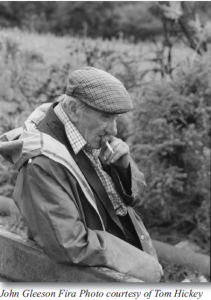 (Ken) Brown who also resided at Silvermines Cottage and was also elected to the Board. Although mining ceased in January 1958, the Company was active in seeking new investors and engaged in negotiations with various interests aimed at seeking investments in the Silvermines lead, zinc and baryte properties. Towards the end of 1959, Mr. Orion Van Dyke, Senior Vice-President of Magnet Cove Barium Corporation of Houston, Texas, visited Silvermines and expressed interest in the baryte mine at Ballinoe, west of the village of Silvermines. After several months of negotiations Magnet Cove were granted an Option Agreement, which they exercised just prior to the closing date of 1st September 1960. The Agreement provided that Silvermines would receive a minimum yearly payment of $50,000 or $1 per ton of baryte ore exported from the mine: the sum was subsequently increased to $3.75 per ton. A new Irish Company was formed, Magcobar (Ireland), and the mine commenced in April 1963, five years after the closure of the Lead mine at Shallee. The ore was transported by road to Foynes Port in Co. Limerick where it was ground into fine baryte at Magcobar’s Plant and exported to various destinations for use in drilling. The first royalty payment of $50,000 from Magcobar was received in 1963, and this, together with sales of staff houses at Silvermines and machinery from the Shallee mine, enabled the Company to make a start on repaying the creditors. The Magcobar development was an open cast mine and differed from underground in that large amounts of slag or waste are discarded during production. With the passing of years huge amounts of mine waste were dumped on the southern slopes of the Silvermines Mountain, which changed the landscape of the area. As the mine progressed, the quarry from which the ore was extracted also got larger and larger and necessitated constant pumping to keep the mine free of flooding. By 1989 the Magcobar operation was nearing the end of its operation and closed in 1993 after thirty years of processing. Silvermines Lead and Zinc Company remained active in seeking further development for their property in Silvermines. Elsewhere in Ireland, mining was underway in Avoca and in Tynagh, Co. Galway. The Mining climate was good and markets were buoyant. In 1962 the Board of Silvermines had considered a number of proposals from mining and other groups. By October 1962 an agreement provided guaranteed expenditures in the exploration programme, with a non-assessable 25% interest to be retained by Silvermines Ltd. The resultant company was Mogul Mines Ltd., 75% and Silvermines Ltd, 25%. Interestingly, the agreement excluded the calamine deposit at Ballygowan South (south of Silvermines Village) and the Baryte sub-lease area at Ballinoe, which in 1962 had yet to commence production under Magcobar. The exploration programme was the most comprehensive ever conducted in Silvermines. February, 1964 was circulated to all shareholders from H.W. Knight, Jr., President and General Manager of Consolidated Mogul Mines Ltd, that made interesting reading for the future of the planned mine. A period of 30 months from the commencement of the shaft sinking would be required for mine development and plant construction. The plant construction was completed by the end of April 1968 and the first mine ore was introduced into the crushing circuit on May 20th of that year. Grinding commenced on May 20th. 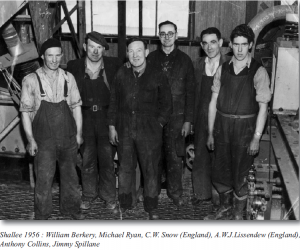 The first smelter shipment was made from Foynes, Co. Limerick on 2 July, 1968, thus culminating an effort which commenced in October, 1962. Before development works could begin, the necessary land would need to be acquired and Mogul proceeded to purchase large tracts of land in the designated area. Many farmers were slow to part with their land in view of the implications of leaving their own farm and moving to other locations. Fourteen families in the area under development were removed from farming because of the mine development. The Official Opening of the mine on 11 September, 1968, was an elaborate event. Three marquees were erected at the Mine site in Garryard, Silvermines and guests numbering over 600 were invited, which included 150 press personnel. A special train was laid on by C.I.E from Dublin to the Mine sidings at the plant. Arrivals by train included Mr. Liam Cosgrave, T.D., leader of the Opposition in Dáil Éireann. 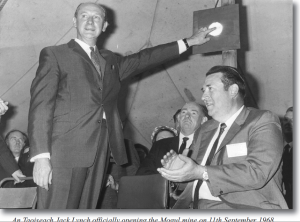 An Taoiseach, Mr. Jack Lynch, T.D., officially opened the mine and was given a tour of the plant. Many directors from Canada also attended the opening. The plant cost $22million (£8.8million) to erect and was built within the projected timescale. When complete, it was the largest base metal mine in Europe and the by far the largest single employer of North Tipperary, employing over 500 people. The plant was designed to mine 3,000 tons of ore per day and produce 400 tons of concentrate for transporting to Foynes by rail each day. The Official Opening Publication features an excellent painting of the completed Mine Plant, featuring the newly developed rail spur from the Limerick – Nenagh rail line. The scene was painted by Chief Chemist, F.R.Janes, who resided at Summerhill, Nenagh. The social impact of the Mogul of Ireland Mine in Silvermines had a tremendous effect on the area, extending to neighbouring towns and counties. It was a high-paying mine and created a variety of skilled, semi-skilled and unskilled jobs, many with bonus opportunities for extra earnings. It operated a shift work system, with several shifts: 8a.m – 4p.m., 8 p.m- 4 a.m, 4 p.m. – 12 midnight, 12 midnight to 8 a.m. There had never been an industry with such an immediate effect on the hinterland. Workers were drawn to the mine from far and near. In Nenagh, 16 houses were built by the Company and given the name Knight’s Crescent, after the original chairman, Mr. Bud Knight, Chairman, Consolidated Mogul Mines. At Ballygraigue, 36 houses were built by the National Building Corporation, to accommodate workers and their families. The press release from Kerr Addison Mines Limited, Toronto, Ontario, dated 10 March 1982 at 4 p.m., was similar. Unsurprisingly the news made national and local headlines with an editorial in the Irish Independent dated Saturday, 6 March, 1982, stating that the mine’s annual wage bill was about £3 million. Despite efforts to keep the mine open, the mine closed at the end of July, 1982, so ending the most intensive mining period in Silvermines. The Company had produced ten million tons of ore at 2.7% Pb and 7.4% Zn. Before closure the Company entered into a very expensive extra-statutory redundancy agreement for its employees: it was estimated that it would be in excess of £3,500,000. The aftermath of closure of the Mogul Mine in 1982 and the Magcobar Open Cast Mine in 1993 is deserving of a special paper for a future publication. Such a paper should examine in some detail the problems that unfolded with the Mogul Mine’s 148 acre Tailings Management Facility, (Tailings Pond) in 1984, followed by the threat of a Super Dump which commenced in May 1998 with an application to dewater the quarry at Magcobar, and the subsequent massive campaign of resistance from within the community that proved successful. 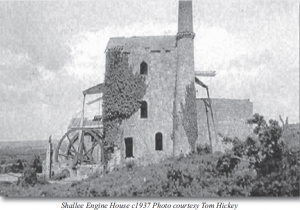 The efforts to develop Ireland’s National Mining Heritage Centre at Shallee is worthy of examination and the eventual announcement by Minister, Noel Dempsey, in August 2005 to allocate €10.6 million for the rehabilitation of six sites in the Silvermines area, a programme without precedent in any part of the State. The programme included the conservation of five 19th century buildings at Ballygowan and Shallee, all now conserved and serving as an important tourism attraction as we enter a new era of Industrial Heritage appreciation. A new beginning for an ancient land!